Fill in the form below and we'll get in touch within 2 working days. I would like to be kept up to date with Brainnwave's products services and events. OK so that is a bit of a tabloid heading and like most tabloid headings it is somewhat misleading and designed deliberately to grab your attention. 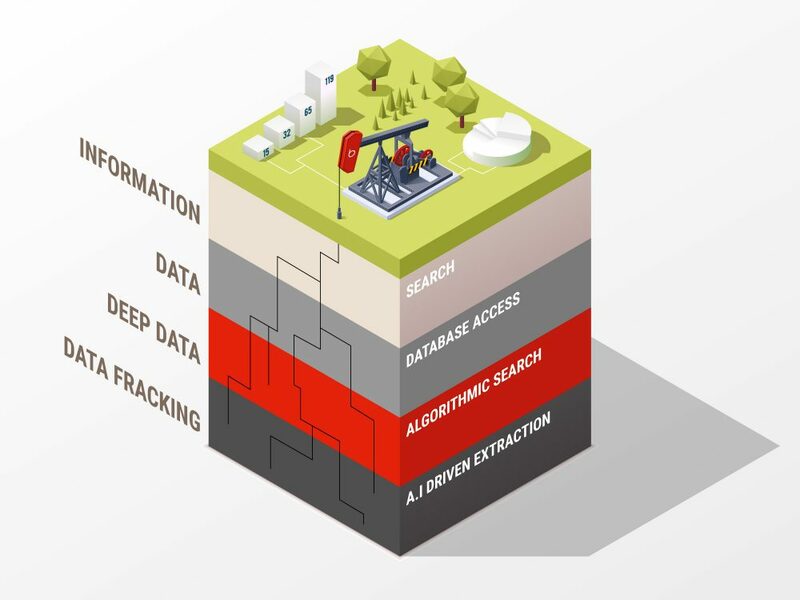 I am not talking about the somewhat controversial practice of fracking for oil and gas but I do like to use it as a metaphor to describe what I see happening in the field of data science and the application of that in business. It’s become so common place over recent years, to talk of ‘data as the new oil’, that it’s easy to not hear it anymore. To not notice when it’s used, nor think of the implications such an analogy brings. You only have to look at the top 6 companies (by market capitalisation) from 2006, with the top 5 for 2016. 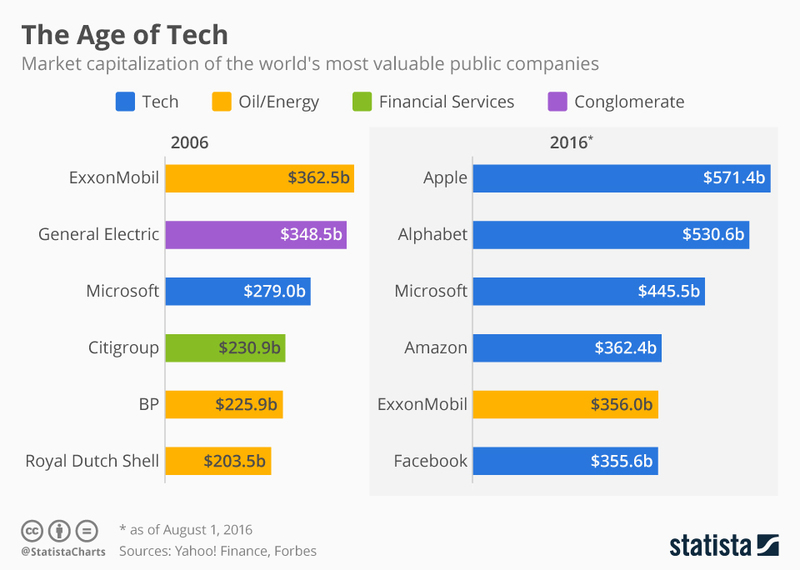 It’s telling to see 2 major oil companies drop out of that list and it now be dominated by 5 businesses that are data businesses as much (or more) than they are technology firms. Last year there was a great article in the Economist magazine. Entitled “Fuel of the Future” it reviews how the new ‘data economy’ is shaping up. That review is structured by comparing how data will fuel the economy of the 21st century, when considering how oil fuelled the 20th century economy. I talk more about that article in my blog Drilling deeper into Data as the New Oil. Much like the natural resources world we started off with mining for things like coal to bring us energy. Data mining became a popular phrase in the 90’s and early 2000’s and is commonly used to describe the process of sorting through large data sets to identify patterns and establish relationships to solve problems through data analysis. However the world is changing quickly and I have seen many different statistics to highlight that the world of data is exploding. What these headline statistics often don’t portray is the variety and complexity of the types of data now available. This is where I like to bring in the metaphor of data fracking®, and by that I mean the process of employing superior techniques to extract the most inaccessible – but most relevant – data on the web and in businesses. Just as with any prospecting, the most valuable data deposits are increasingly hard to locate – and even harder to extract. The science of data mining is rapidly changing. To discover the most meaningful answers, professionals need to dig deeper to unlock remote, hard-to-reach places. Once you have found those deposits you inject artificial intelligence to extract and identify patterns and bring those insights to the surface so they can be used in decision making or to change behaviours. Welcome to the new age of data fracking®. Originally published on the Datafest news feed. Brainnwave achieved more in 2 months with 4 analysts than a tier 1 consultancy achieved in 6 months with 6 people. Brainnwave are a great team to work with. They put a focus on working collaboratively with us and they make sure that they’ve always understood what we need. Their solution has already saved a lot of time through the automation of organising, updating and sharing some of our day to day data (such as fuel prices) across the organisation. Brainnwave are helping change the way we do business. The platform enables us to make more informed decisions. The platform Brainnwave are developing is using data analytics to provide us with the insights that we cannot access today due to the complexity of the questions we need to answer. This will be a game changer for our global business. We are delighted to be working with our Partner, Brainnwave, on their new product, Geo Spatial Web Services. Brainnwave’s new product provides efficient access to our geospatial data providing users with the ability to analyse the data and generate strategic insights to aid their business. Brainnwave has been instrumental in helping UNICEF understand how people move so we can coordinate relief assistance in a much better, more targeted way and can assist the population where the need is greatest. I have always been a visual thinker and Brainnwave’s Ossian platform enables me to see things that were previously buried deep within reports; this helps me to react quickly to the business environment and make decisions with confidence. I have been championing, for some time now, the need to bring digital innovation from other industries into the housing sector. We are excited to be working with Brainnwave to apply their data intelligence technology to the housing sector. Their innovative approach to data and analytics, developing deep insights about our customers, has never been done before and will help us provide the best possible customer experience.